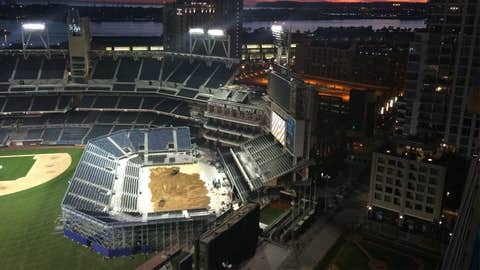 Jan 17, 2014; San Diego, CA; Construction of the clay court in left field of Petco Park for the Davis Cup is visible from atop the Diamondview Tower on 10th Avenue in downtown. Petco Park will be the first open-air baseball stadium to host Davis Cup matches. SAN DIEGO (AP) — Wimbledon champion Andy Murray was impressed with both the setting and the city where the first round of the Davis Cup match between the United States and Great Britain will take place this weekend. "It looks great, it’s a cool, cool place," Murray said of the clay court that has been set up in left field of the San Diego Padres’ Petco Park for the matches Friday, Saturday and Sunday. "I think it’s going to basically be a great spectacle for the people who are coming to watch it." Murray joined British teammates Kyle Edmund, James Ward, doubles specialist Colin Fleming and captain Leon Smith in a news conference Wednesday at Petco Park, the first open-air baseball stadium to host Davis Cup matches. While agreeing with Murray about the "unique setting," Smith took time to talk about the conditions of the clay courts. "I think the first few days there wasn’t much moisture on the court, which is pretty normal when they’re trying to make the clay embed itself," said Smith. "It has gotten better the last few days the more play there has been going on. "I think they are watering it a bit more, so it’s helping a little bit. But it’s not a true European clay. The main thing is it’s a slippery court." Murray has had to make his own adjustments since winning Wimbledon last summer. "Since then I’ve had some injury problems," said Murray. "I had back surgery so I’m still recovering to top form and hopefully getting 100 percent fit again." While acknowledging his better play on hard courts and grass, Murray said "if you want to get to the top you have to play well on all surfaces." Murray said he is enjoying his time in San Diego. "It’s not often we go to cities where you’ve never been before," said Murray. "It’s a great unique place. It looks great and it’s a place I’d like to come back to sometime when I’m not playing a tennis tournament." Murray also responded to questions about his recent tweet that he was getting married to girlfriend Kim Sears after Wimbledon. Murray acknowledged the tweet was his, but that he was just kidding.